Rosa is a three-month-old hen who has a beak deformity known as scissors beak. Despite her deformity, Rosa is very sociable and talkative---she’ll chirp and tweet all day and doesn’t discriminate among species for she is friendly to humans and animals of all shapes and sizes. Upon arrival at Odd Man Inn, Rosa was grossly underweight, weighing in at only 348 grams. 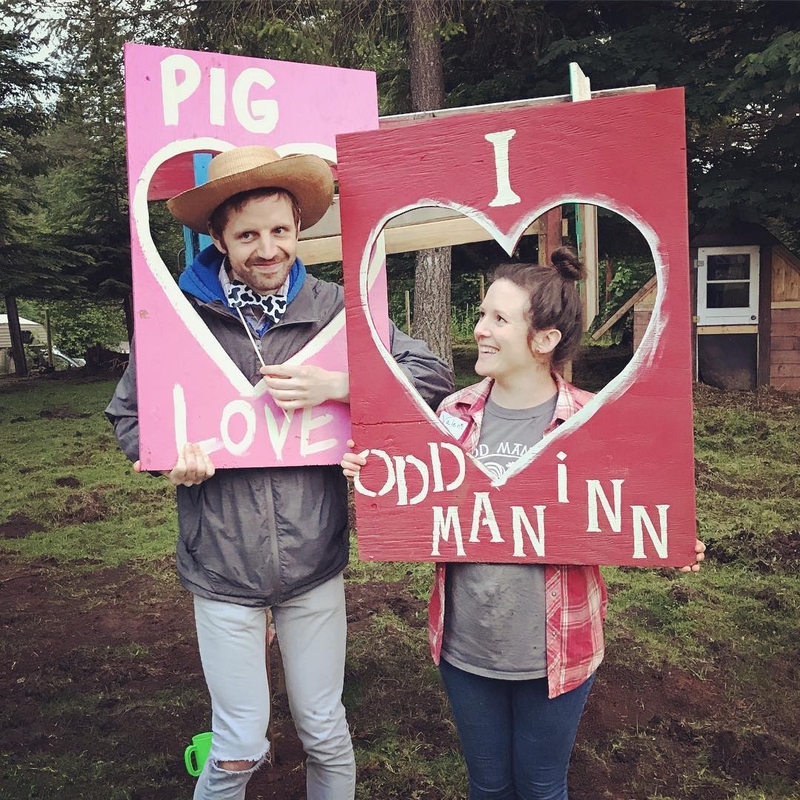 Wendy and Josh, who are both the founders of Odd Man Inn, immediately made an appointment for Rosa to see their veterinarian, Dr. Kate Hooper at VCA East Mill Plain in Vancouver, WA. Dr. Hooper gave Rosa an initial wellness exam to evaluate her health status. Other than being underweight, Dr. Hooper reported that Rosa was in good health. However, in order to help Rosa gain weight, she would need to be syringe fed her meals, twice a day and have her weight regularly monitored. Being an animal sanctuary, both Wendy and Josh were already familiar with syringe feeding sick birds and aware of the proper technique. Living Arrangements: Since Rosa is at an increased risk of getting bullied by the other birds in the flock, due to her deformity, she was separated from the flock. 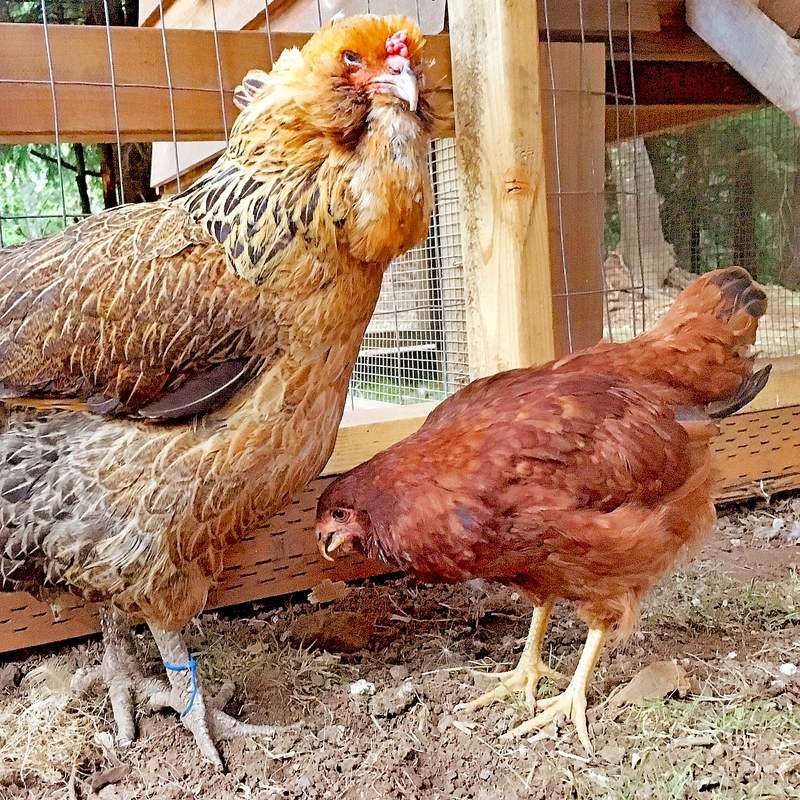 During the warmer months of the year, Rosa lives outside in a predator-proofed coop, where she enjoys the company of two other special birds--Olive, a blind naked neck and Weezy, an elderly Ameraucana hen. 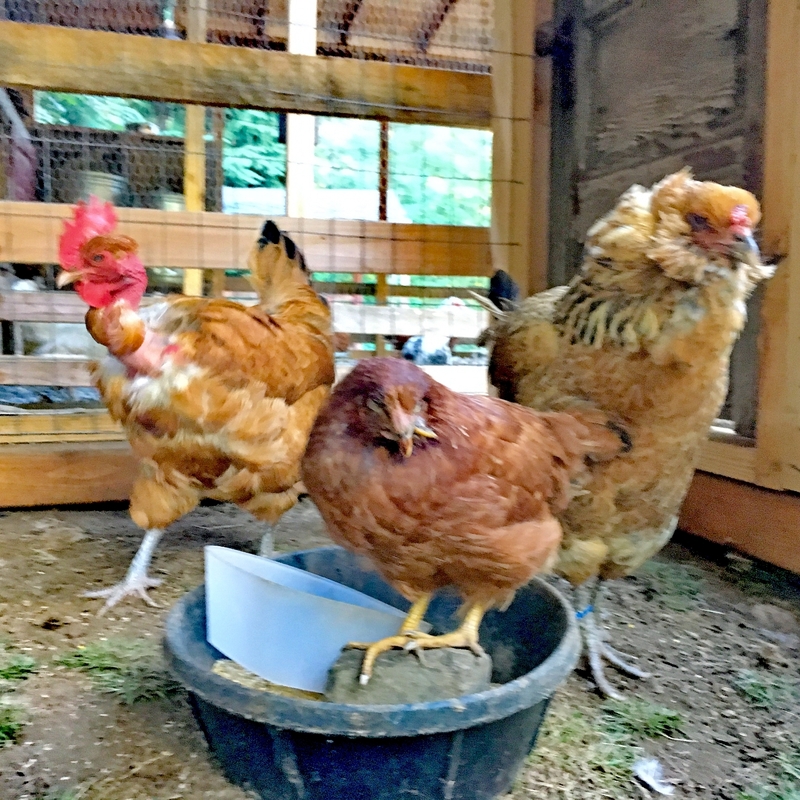 The three birds are kept separate from the big coop so that Wendy or Josh can have easier access to them for they require more frequent daily attention. In the colder months, Rosa and the other special birds will be brought inside. Diet: Rosa is syringe fed her meals daily. The number of feedings needed fluctuates depending on her rate of weight gain. They feed her with a puree made from a combination of chick feed, warm water, and Enfamil Poly-Vi-Sol (a liquid multivitamin supplement for infants manufactured by Mead Johnson Nutrition). The puree mixture is prepared fresh each day and blended together using a Blendtech blender/juicer. Rosa doesn’t completely LOVE being syringe fed, but she does enjoy being held and sitting on either the arm of the chair or on her human’s knee for extended periods of time. Special Provisions: During the daytime, while Rosa is out with the other two special needs birds, she is given her own deep bowl of chick feed to snack on. 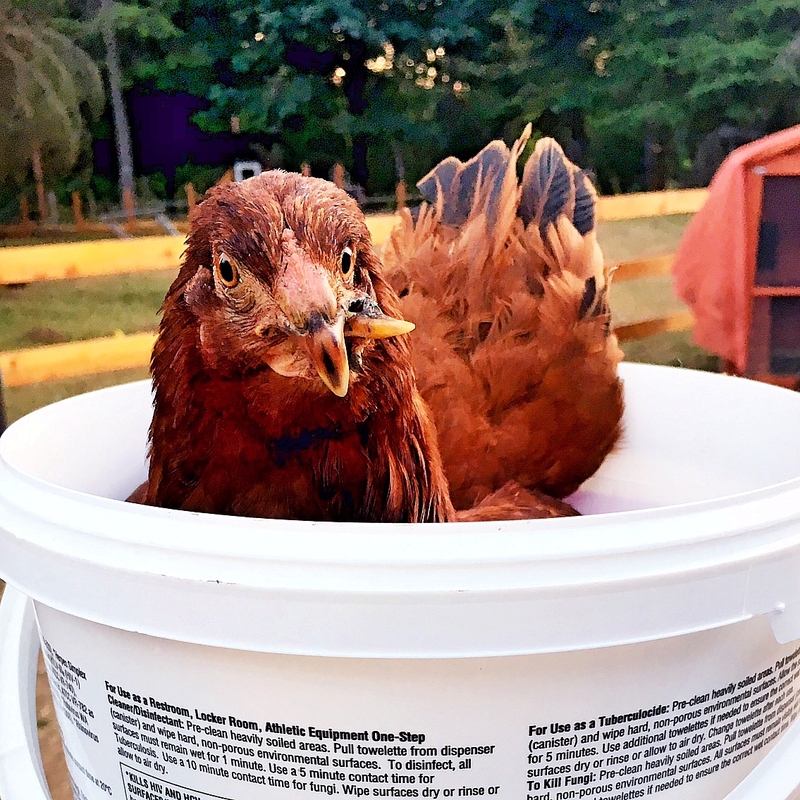 Although most of the feed ends up stuck in her beak or on the ground beside the bowl, it is beneficial for it keeps her occupied and provides her with a sense of satisfaction being that eating is a normal chicken activity. Having her own personal bowl helps to prevent any potential scuffles with the other birds. Rosa is also given a deep bowl of water, as with a deeper bowl she can submerge her beak under the water to help keep it clean. Keeping Rosa’s Beak Clean: Even with her deep bowl of water, Rosa ends up getting feed stuck up in her beak. Since the feed can quickly become sour when wet and can potentially cause thrush and other issues, Wendy or Josh makes sure to clean out her beak at least once a day, using a small toothbrush. 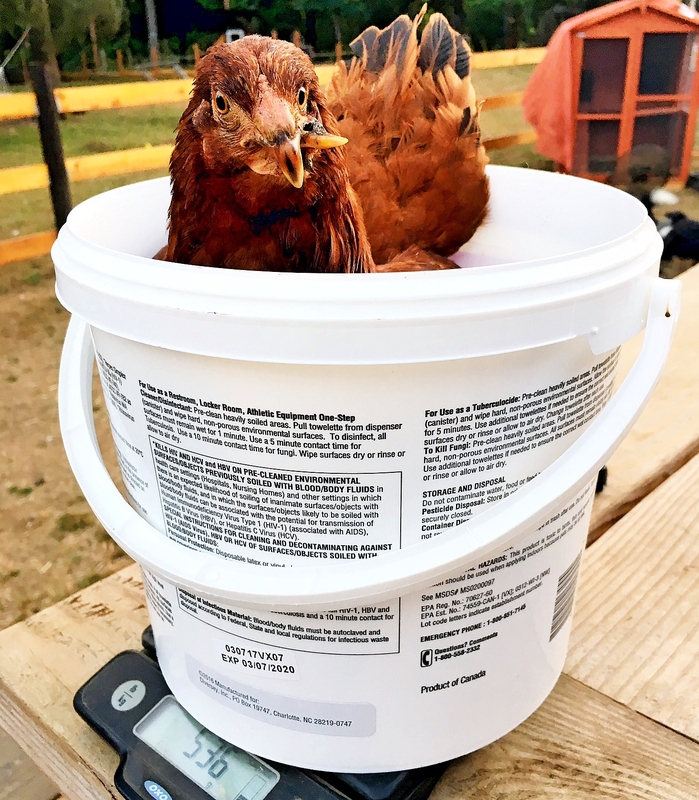 To keep track of Rosa’s weight gain, Wendy or Josh put Rosa in a little bucket and place her on a gram scale to weigh her at the end of each week. A week after Rosa first began receiving syringe fed meals twice a day, her weight increased by 12%. By the second week, her weight increased by 27%, weighing in at 495 grams. However since the third week Rosa lost weight, her syringe feedings have increased to 3 a day. Since Rosa is still young and her body is TRYING to grow, her caloric requirements are really high. Wendy and Josh will continue to monitor her weight and will adjust her feedings as needed, to make sure she continues to gain weight. Morning Blowouts: Normally, chickens will straighten and clean their feathers (preen) with their beaks. However, since Rosa is not able to do this on her own, as a result of her beak deformity, she receives daily blow outs with a hair dryer to help keep her feathers clean. Beak Trimmings: Every two weeks, Rosa is taken to the vet for a beak trimming. 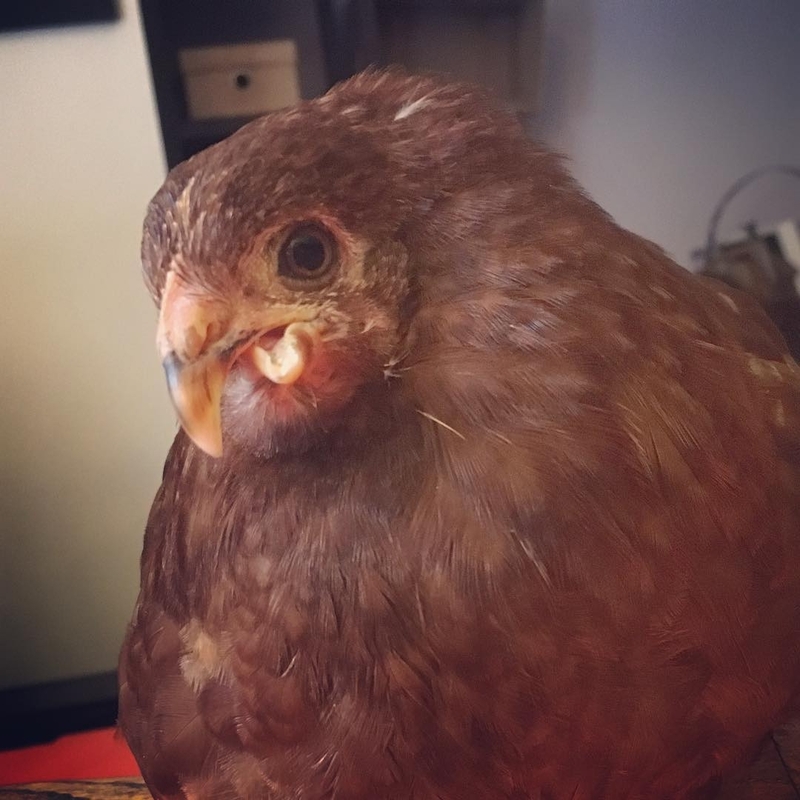 Since Rosa is not able to use her beak as a normal chicken would, without regular attention, it will overgrow. Rosa has formed a particularly special bond with Weezy. Weezy is very motherly and protective towards Rosa, as if she were her foster mom. 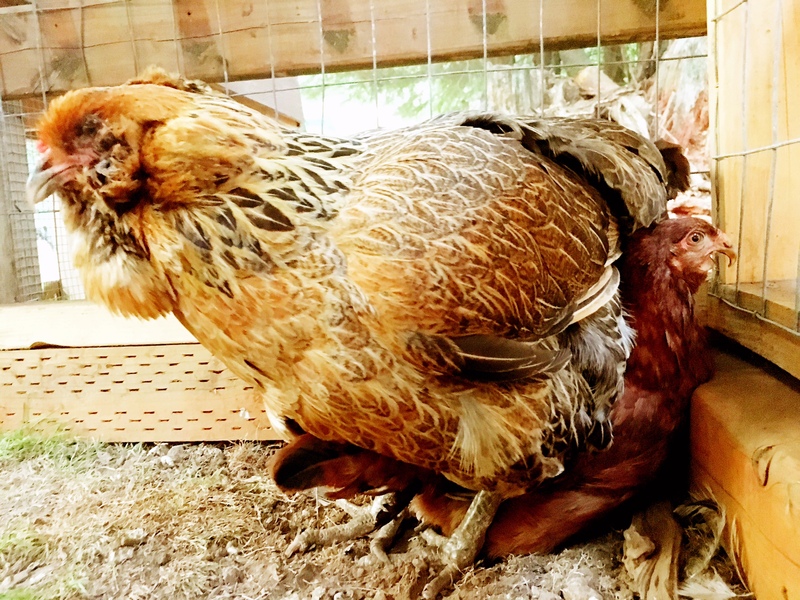 Each night, instead of roosting on the perch, Rosa sleeps underneath Weezy on the bottom of the coop; during which time, they’ll continuously chirp back and forth to one another. 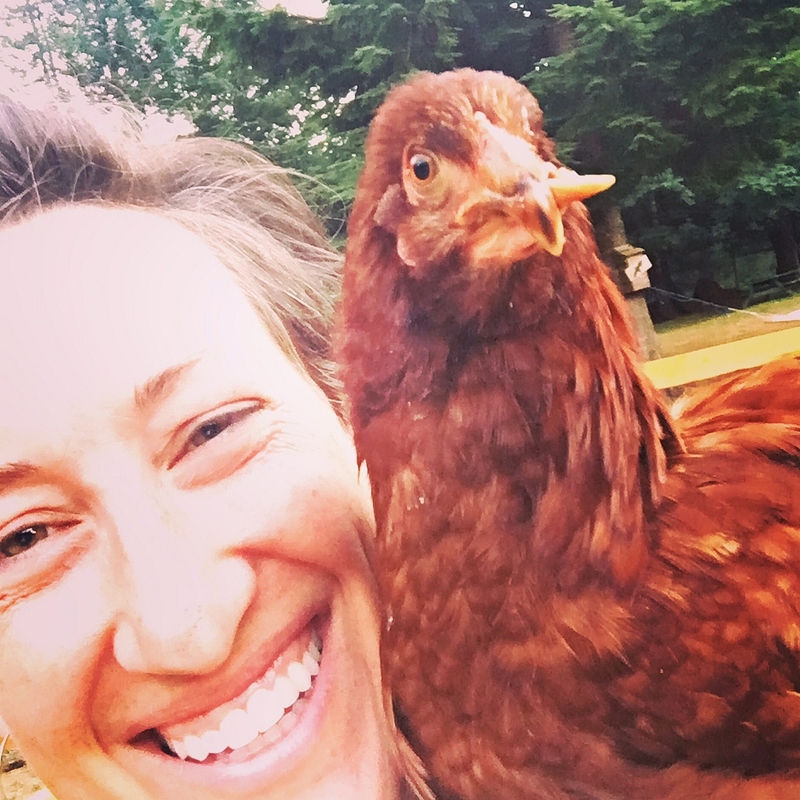 Wendy believes that the unique bond Weezy and Rosa share is related to the fact that since Rosa came from a hatchery, she never knew her mother, and being an older hen, Weezy was happy to take on that role. 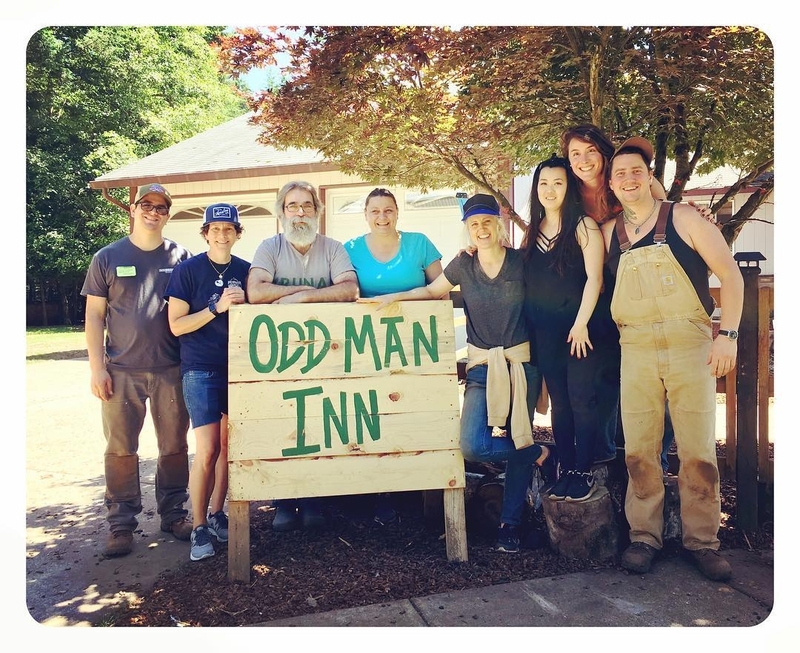 Odd Man Inn Animal Refuge, located in Washougal, Washington is a 501 (c) 3 nonprofit home for wayward critters. The refuge is situated on four acres in the more rural Columbia River Gorge of Washington. The organization was founded in 2015 and is dedicated to taking in animals in need of a home and rescuing those who are out of options. They currently provide a loving home to over 115 rescued animals—which including pigs, goats, llamas, sheep, chickens, ducks, geese, dogs, cats, and bunnies. 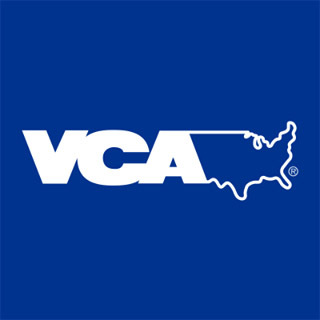 VCA East Mill Plain, located in Vancouver, WA is an animal hospital which provides veterinary care to a wide range of small animal species---including dogs, cats, birds, reptiles, guinea pigs, rabbits, and of course chickens and other poultry. The hospital has five full time veterinarians with a wide range of expertise and skillsets.